Verizon hosted a breakfast event for industry analysts at CES today, offering a sneak peek at forthcoming 4G LTE developments. Alcatel-Lucent setup a live LTE network for partner demonstrations of LTE devices and applications. 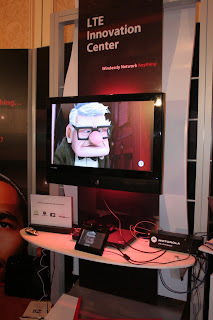 This photo shows an HD video streaming over LTE to a tablet device and the widescreen flat panel TV. Other applications demonstrated included home security and energy management.